The best way to help is to spread the word! And, if you can, donate when we have fundraising efforts. Feel free to contact us directly if you would like to donate in between fundraisers, or if you would like to donate items for raffle and auction. Also, if you want to volunteer time, let us know! 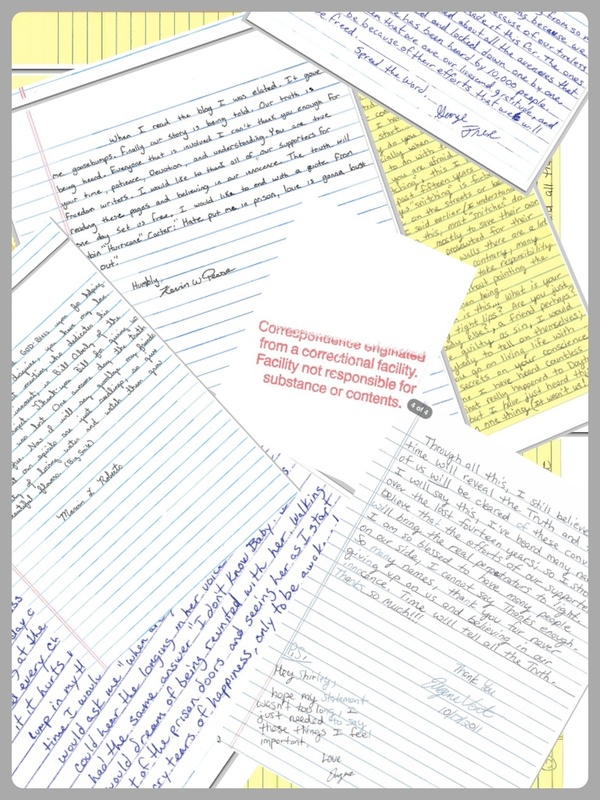 From writing letters to hanging fliers to cooking…..there are plenty of opportunities! John Hartman was killed in the commission of a premeditated racial hate crime. “A hate crime is a traditional offense like murder, arson, or vandalism with an added element of bias. For the purposes of collecting statistics, Congress has defined a hate crime as a ‘criminal offense against a person or property motivated in whole or in part by an offender’s bias against a race, religion, disability, ethnic origin or sexual orientation.’” – F.B.I. 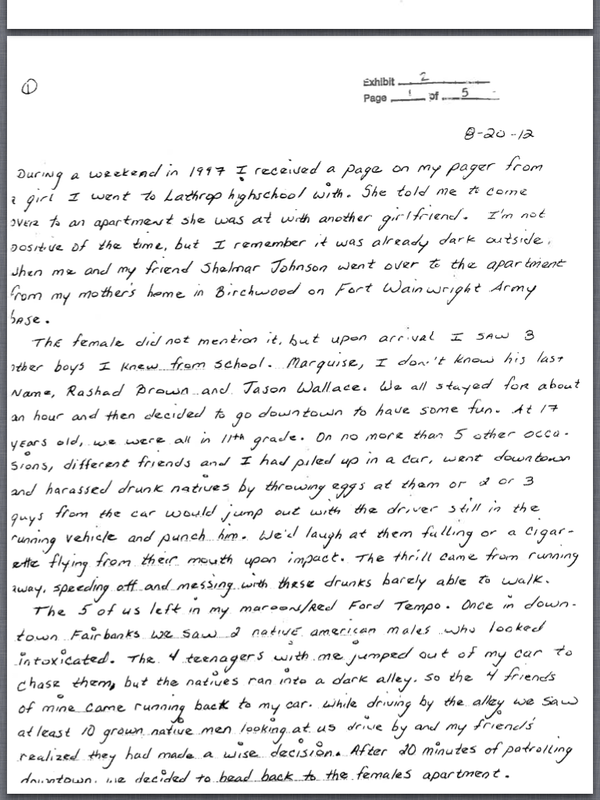 According to William Holmes who confessed in detail to his role in killing John Hartman, he and four friends went out onto the streets of Fairbanks the night they attacked Hartman to physically assault Native Alaskans. Holmes and his fellow conspirators “decided to go downtown and have some fun.” Their idea of “fun”? On the night that they killed John Hartman, Holmes describes patrolling downtown looking for Native victims. The group found at least one victim, but their attack was thwarted when others appeared on the scene. 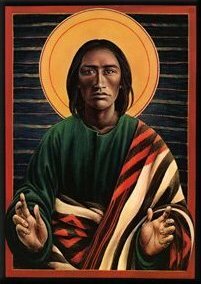 When they were unable to find the victim they were looking for – a vulnerable Native person walking alone – they decided to end their “fun.” Sadly, as they were driving out of the downtown area they spotted “a white boy” walking alone and decided he would have to do. The group fell on the young boy with no warning, knocked him to the ground, and kicked him into a coma that would prove fatal. John Hartman was kicked and stomped to death with violence so callous it defies explanation. He was killed because five young men carried with them a racial hate so strong and dehumanizing that group beatings of vulnerable Natives was a form of recreation. John Hartman was killed by hate directed toward a race of people he did not belong to in life. But in death, he joined a long list of the persecuted. He is not the first boy to die at the hands of race-based violence, but he may be the only white child to die in the cross-hairs of racism against Alaska’s first people. For the majority of Fairbanks residents the idea that a young person could be attacked at random and assaulted simply for walking alone was unfathomable. Yet, for another sector of the community, it was routine. The other side of the story in a community where violent beatings are a form of recreation, and a person’s ethnicity is what makes them a target, and in turn makes them invisible to the rest of the community, was that there was a legion of kids who were familiar with the attacks. Scores of boys who were on guard, who slipped into the bushes when a car approached, who ran like hell when they heard the sound of tires slowing down behind them because those kids knew it was the cops or the people who jumped Natives, and that both were dangerous. Kids who curled into a ball and protected their heads if they didn’t run fast enough. If they had found the victim they meant to find, maybe no one would have died. Eugene. Eugene was walking alone that night. They wanted Eugene, but the timing was off. George. George walked downtown the very same evening, and George was exactly who they were looking for. Pick a name off the witness list. Pull a name from the wedding guest book. 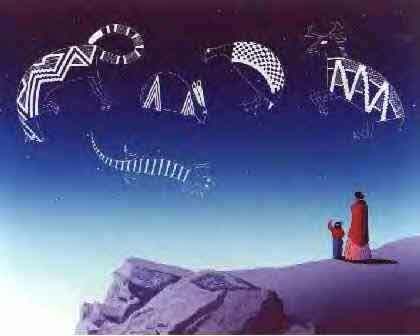 Nearly every person whose life would intersect with the wrongful arrest, trials, conviction, and decades long fight to overturn it was guilty of the crime of being Native that night, and it was hate directed at them that motivated the men who killed John Hartman. It was that same hate, woven into the fabric of the community and its institutions, which allowed for the immediate arrest and wrongful conviction of people who were guilty of nothing besides being Native. 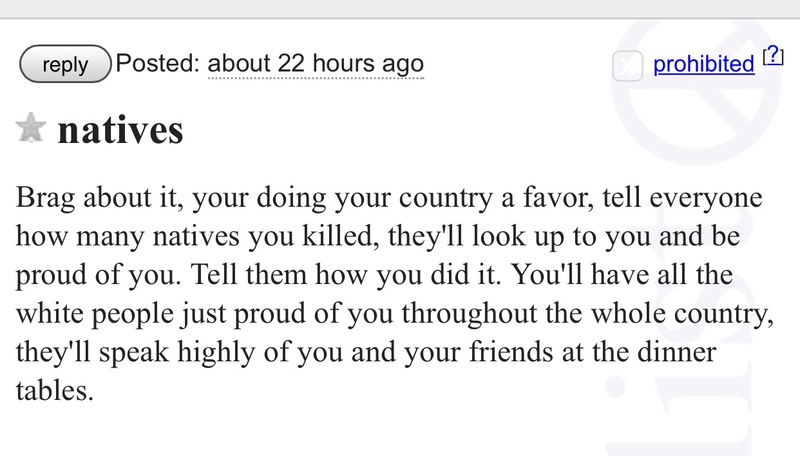 This hate is alive and well, virtually unchanged since 1997. Ask any Native man if they have been physically attacked in the streets of Fairbanks at random, and you will hear the stories. Read the crime statistics, sexual assault statistics, human rights reports. Read. Open your eyes, look. 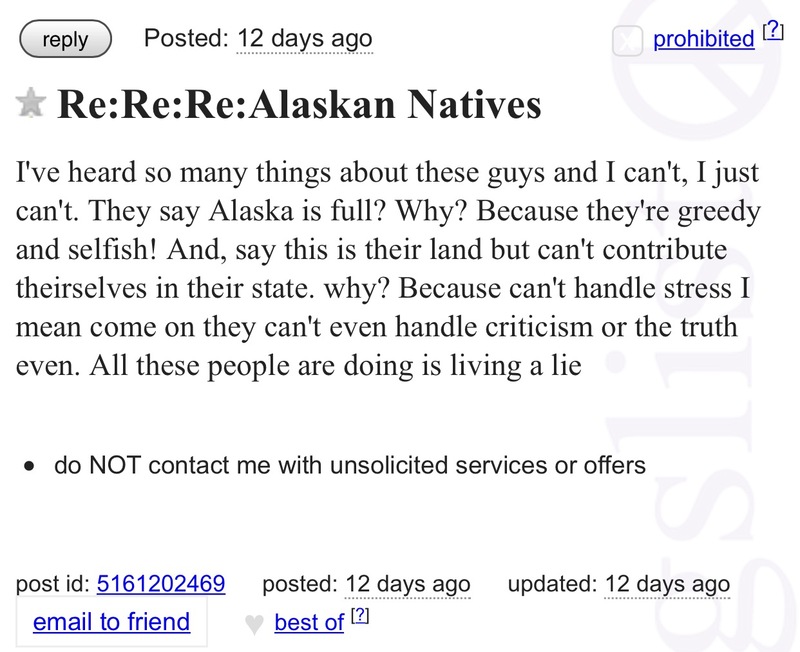 Open any Alaskan Craigslist and word search the term “Natives,” and you will read the thoughts of the community members who carry this hate. 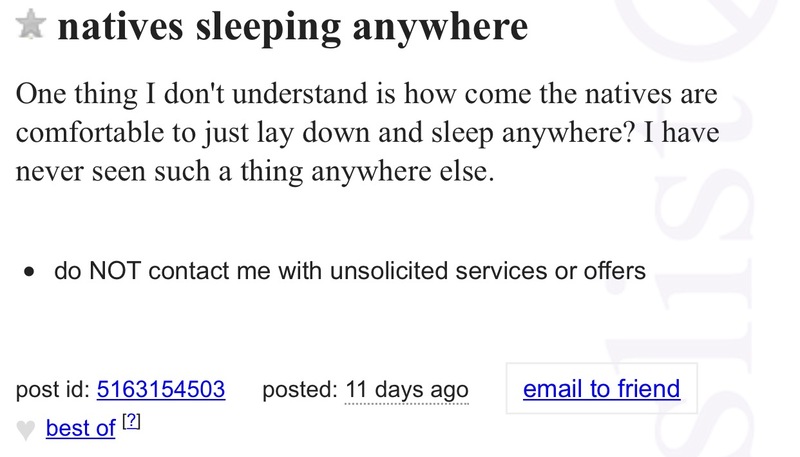 The posts below are chosen at random, and simply some of the most recent posts on the topic in the local Craigslist. We include them simply as a reminder that this hate remains, and offer it as “proof” of racism to those readers who believe that racism does not exist, or that conversations about race undermine the credibility of our cause. We are not playing the race card. We are playing the had we were dealt. The newspapers continue to describe the assault as random, when in reality the assault that killed John Hartman was premeditated, and the motivation was racial hate. The fact that he was walking at that moment, at that intersection, that the men responsible had not been able to find their ideal victim, that the assault proved fatal – perhaps all of that can be considered the product of coincidence. But his murder was not random violence – it was very specific and intentional violence. The two most common pieces of advice we receive in writing this blog are to avoid writing about race or John Hartman, because it makes people uncomfortable. But we are not here to make anyone comfortable, we are here to tell the truth. And the truth is, race was a huge factor in this case. Racial hate motivated the crime, it motivated the wrongful arrest and conviction of innocent young men, and it was the overtly stated factor used to dismiss the testimony of many witnesses. John Hartman deserves justice. He was killed in hate and denied justice in hate, and that is not an acceptable legacy for a loved and innocent child. Nearly every person who speaks of this young man in life emphasizes his kindness and open-mindedness. He deserves better than this. His family deserves the truth. The community that rallied around his memory and his family to demand justice deserve the truth. The answer to hate is not silence. The answer to hate is not fear. 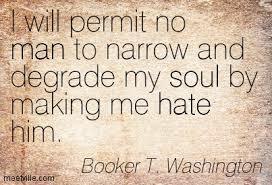 The answer to hate is not regret, grief, shame, and it certainly is not hate. The only counter to hate is love. So with love, we think it is time to start an honest conversation about race in this case, race in our community, and what we can do to change the future for the better. Readers, we want to hear what you have to say. Leave a comment, tell your story, share your thoughts. We heard the advice loud and clear to stay away from the topic of race so that people feel comfortable, and it reminded us how very important it is to make people uncomfortable. This post will mark the first in a series about race in this case, because if we can’t even say the words, we will never be able to change the story. We welcome contributors. One of the hardest things about attracting support for wrongful conviction is that it makes people uncomfortable. 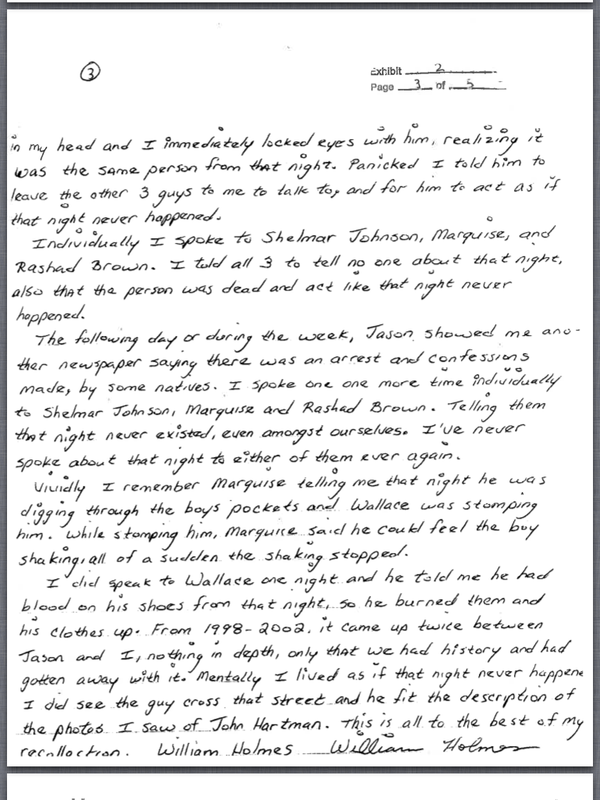 Stories of wrongful conviction are unsettling and full of things that human beings like to turn a blind eye to. Murder. Evil. Corruption. No one wants to think about innocent people persecuted and guilty men free. It makes us fear our neighbors and shakes our view of justice. No one finds comfort in considering that the world may be very different than it appears to be – that perhaps the people and institutions we have been led to believe are good and trustworthy are sometimes dark and corrupt. In general, people turn away from the troubles of others when they are afraid to turn toward them. Wrongful conviction is also not familiar. It is easy to raise money for hungry children. Everyone can relate to the plight of a hungry child. It is fun to raise money for education. Nothing unsettles us about a bake sale for a field trip, or a car wash for new cheer leading uniforms. Wrongful conviction is a very important social issue, but one most people turn from in discomfort. You don’t see many wrongful conviction bakes sales and car washes. We would like to change that. 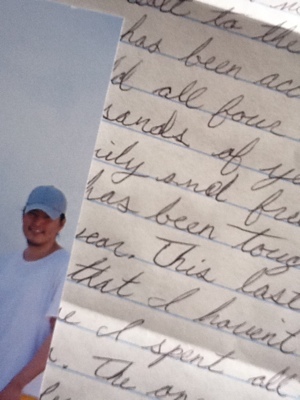 Through months and months of raising awareness about the case of the Fairbanks Four we have often wished for a way to make wrongful conviction familiar so that the general population could understand how terribly important it is and could relate. We even wished for a famous example of wrongful conviction or imprisonment…..more famous than Gandhi, more understood than even Martin Luther King. It just seemed like if there was a wrongfully convicted person whose story was well-known – whom billions believed absolutely was innocent, whose story was woven into the fabric of society – that perhaps people be more willing to take a stand on wrongful conviction. And then, we remembered someone. Guess who? 24.9 million people search his name on Google in an average month. About 40% of the books printed in the history of the world are about him. There are 7 billion people on the planet. It is estimated that greater than 6 billion of these people know his life story. 2.3 billion of them worship him. 76% of Americans participate in a religions whose primary objective is to learn from this man’s life and lessons. 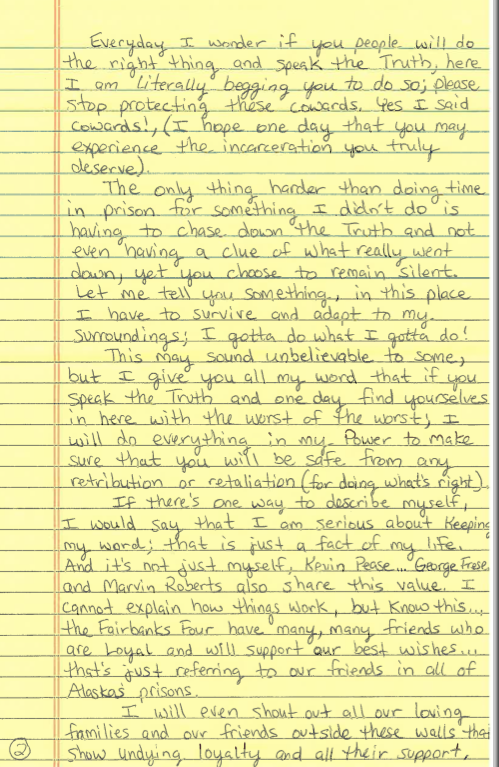 He was wrongfully convicted of a crime by a corrupt court. He was found guilty, in part, with the false testimony of an associate of his who had some small thing to gain with the lie. One of his closest friends denied knowing him to avoid being associated with the situation. He was beaten, tortured, and executed. He was then exonerated. He rose back up from his execution. All of this, according to the Bible, to teach the people on Earth. Lessons on judgement, kindness, compassion, and justice. Ultimately, to teach them that it is important not to turn away from suffering and injustice but to live a life that opposes it. The most famous man to ever walk the Earth is Jesus Christ. He was also a wrongfully convicted man. His wrongful conviction is not an aside or interesting plot twist – it is the central event in the story. If a story that 76% of America studies and believes is literally a story of wrongful conviction, it is a fascinating hypocrisy that most of his modern-day followers turn in disgust when the same story plays out. So, am I comparing the Fairbanks Four to Jesus? Yep. Isn’t that the point? 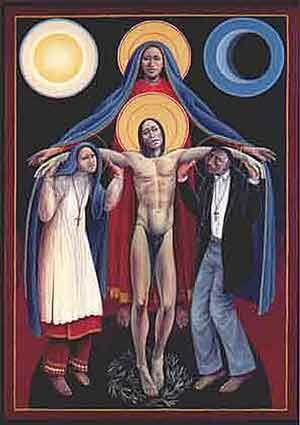 That Jesus was only a human being, sent here to suffer through the worst trials and pains a human being can encounter? And wasn’t all of this suffering deliberate and intended to make the world and its people better able to live just and kind lives through the understanding of his life? 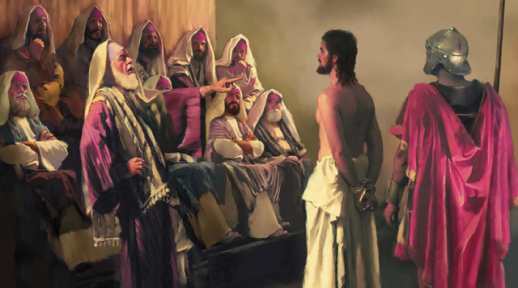 In his time, Jesus was simply a wrongfully convicted man. Most who witnessed his unfair trial stayed quiet or looked the other way. Much of the crowd cheered at his crucifixion. 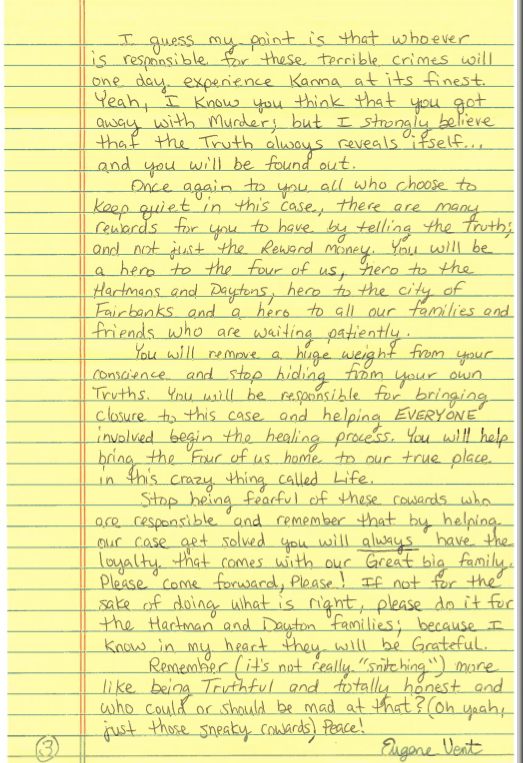 Today, many of his followers say things underneath articles about the Fairbanks Four case in the local Fairbanks Daily Newsminer like, “they had a trial, let them rot.” Or, “bypass Fairbanks if you are ever release,” or, “These men should be hung…scratch that, the electricity it would take to put them in a chair would be less expensive. They aren’t worth the rope it would take to hang them,” or, “I’m going to start my own website, ‘Fry the Fairbanks Four.” A recent one read, “I pray these men never see the light of day and suffer ten times more than the victim, in Jesus’ name.” Wow, I bet Jesus really dug that. These people are statistically very likely to be self-identified Christians. As a matter of fact, 80% of Alaskans identify themselves as followers of Jesus Christ. The great tragedy of organized religion is its complete departure from the tenants on which it was founded. The great tragedy of humanity is that we almost always choose inaction when we encounter the kind of suffering that makes us uncomfortable. 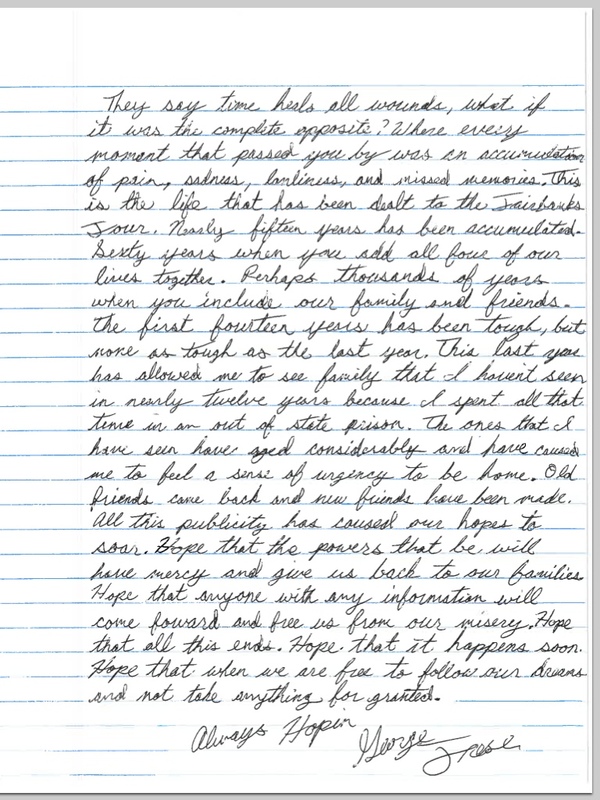 Nearly every person in Fairbanks, Alaska who has taken the time to wish the Fairbanks Four dead, send death threats to their supporters, refuse to look at the facts, and insist that wrongful convictions are not real, also profess to believe that the most important story ever told was that of a wrongfully convicted man and that understanding it the key to heaven. How ironic. How typical. How sickening. 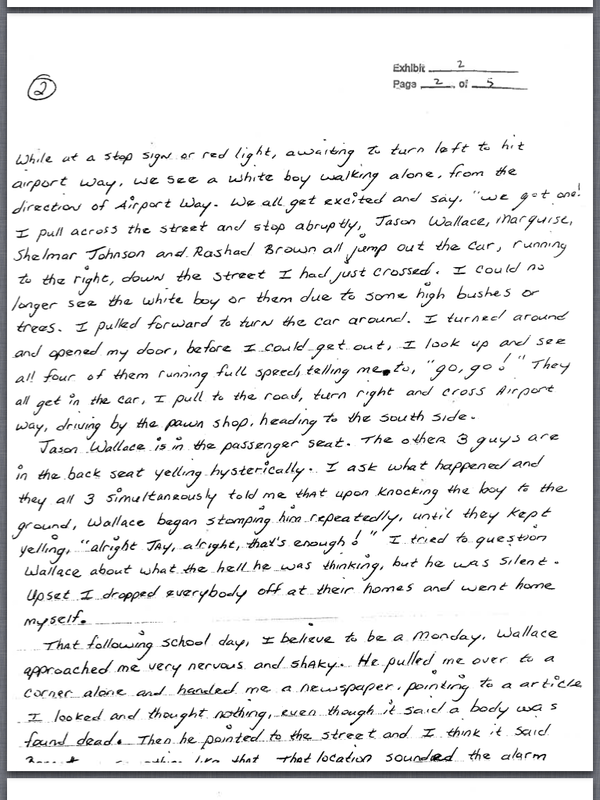 If the Fairbanks Four had been drug through the streets of Fairbanks, tortured, beaten, and crucified in 1997, much of the crowd would have been cheering. Most of the crowd would have been self-proclaimed followers of Jesus Christ literally cheering at a crucifixion. This post is not in any way meant to be an attack on religion. Many of our supporters are Christian people who DO see the importance of taking a stand against injustice. This post is, however, intended to call out the members of our community who show sickening racism, hate, ignorance, or an unwillingness to acknowledge the existence of wrongful conviction while worshiping a wrongfully convicted man. We hope you will take some time to think about that. We hope the church leaders who offer support in private but are afraid of offending their congregations by talking about wrongful conviction from the pulpit will consider that every single one of those people is coming to church to hear a story of wrongful conviction. Maybe it’s time to tell a new one. Maybe it’s time to talk to your church leaders, or seek church leaders who walk the walk and talk the talk. We hope that this post reaches the 80% of the Fairbanks population who, apparently, should be very familiar and comfortable with the injustice of wrongful conviction. And the next time any of you want to condemn these men, or take no action, think for a moment how familiar your role in the story is. Anyone who professes faith in Jesus should be ready to acknowledge the existence, importance, and injustice of wrongful conviction. We have reached a very gratifying moment in this movement. In late November when the first post was written on this blog, the reward for new information in this case sat at $5,500. Through the generosity, work, and effort of the supporters who have been moved by this story to give, and through the ongoing support of Tanana Chiefs Conference, we officially announced today that the reward in this case has reached $35,000.00, which represents a 700% increase. That translates to $250.00 per day since we began. Thank you!! Your love, courage, faith, and determination to see right things in this world WILL free these men someday, and keep an untold many more from seeing the same terrible fate. 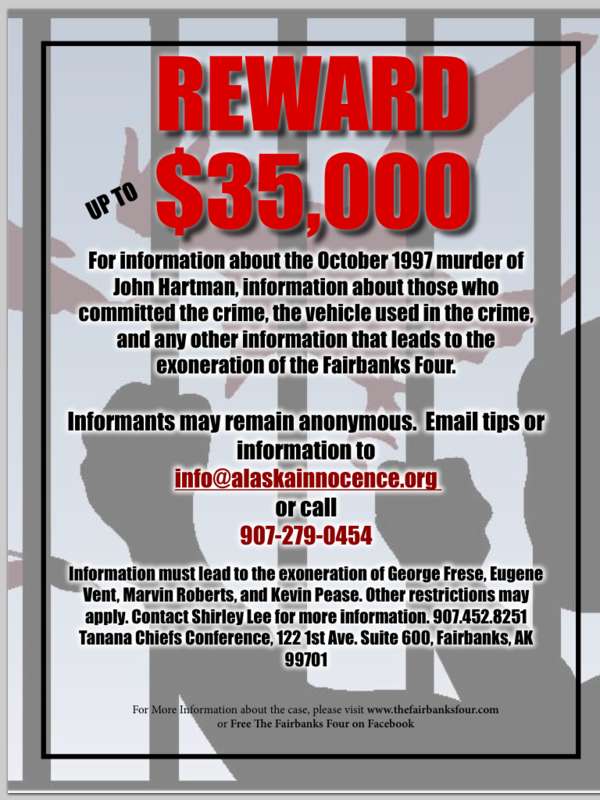 They key to exoneration for the Fairbanks Four through a new trial is for more people to come forward with information about the actual murderers. There are a multitude of reasons that informants remain quiet. Some have said they do not want to be snitches, and nearly all have said that they are afraid. It is not a hard position to relate to – anyone would be hesitant to double-cross a group of killers. But we believe that the reward money will do two things to encourage these people to step forward bravely – one, it will potentially provide them the financial means to move up in life, and out of a crowd of people who would view doing the right thing in this case as snitching. Secondly, we hope it shows that a whole lot of people are counting on them, and have their back when they do come forward. The reward increase was announced today via press release, and featured on Alaska Public Radio. Coverage included an interview with Marvin, Eugene, George, and Kevin. We wish they had been able to use more of the their words, but time constraints kept the clips of them pretty short. We will post that interview as soon as it is available online. In the meantime, share this reward information whenever and wherever you can! Through your work and through God’s grace it will reach the right person. Who knows? Perhaps your simple decision to bring this case up to a stranger at a bus stop, to tack a flyer to that cork board at work, to tell this story – any of those moments could be the ONE that this case turns on. Thank you, every single one of you, for reading, speaking, donating, and acting. When life confronts us with an injustice the easiest and most common choice that human beings make is to do nothing. Yet, as we have quoted many times before, all that is required for evil to prevail is for good men to remain silent. Each of you is extraordinary in your choice to speak up, and each of you is having an impact. I want to tell you that this fight is nearly over. I want to tell you that all the days that lie ahead will be easy. I want to tell you that good has already prevailed. I want to name the day that you can gather together and welcome these men home, the day that racism is over, the day that the justice system is fully just. But I cannot, and this fight may last forever, which makes it all the more worth fighting. All that is required for GOOD to prevail in this world is for people like you to find their voice. 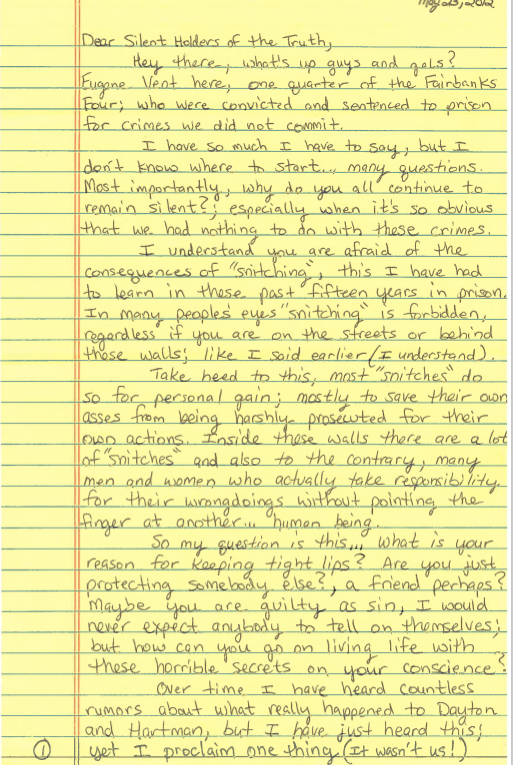 ANYONE that has information, big or small, whether you are ready to talk on the record or want to remain anonymous is asked to email Alaska Innocence at info@alaskainnocence.org or call them at (907) 279-0454. It’s amazing how much can be changed by a cage of concrete and barbed wire. This video covers some basic information about the Fairbanks Four – pass it along, it’s an easy way to tell this story to others!